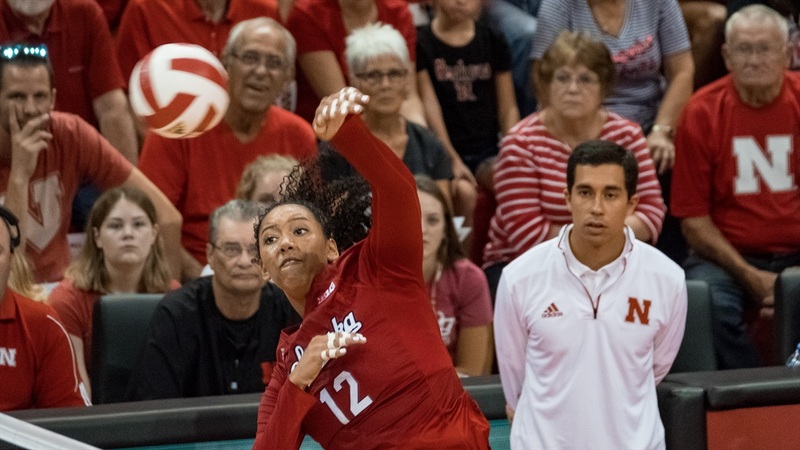 College volleyball is back this weekend and after three seasons on the road, the Huskers are finally hosting the VERT Challenge at the Devaney Center featuring No. 3 Texas, No. 7 Florida, No. 18 Oregon and the second-ranked Huskers. The rotating four-team event began in 2015 in Austin Texas, moved to Eugene, Oregon, in 2016, took place in Gainesville, Florida, last season and will go down in Lincoln this year. Nebraska will take on the Gators on Friday night and the Ducks on Saturday night. “Young babies” is referring to the five freshmen on the team, a few of which are pushing for starting spots from the get-go. Cook said he’s been encouraged by what he’s seen from that group in practice. Despite all its youth, Nebraska is diving into the deep end of the pool with two of their four ranked nonconference opponents right out of the gates. Regardless of the results, Cook sees this weekend as a valuable tool for gauging where his team is at heading into the season. Playing without senior setter and co-captain Kelly Hunter, the Huskers lost to both Florida and Oregon in the VERT Challenge to open last season. Even so, Cook said he came away encouraged by his team’s performance. Florida has a lot of production to replace this season just like Nebraska does, and Cook isn’t quite sure what to expect from the Gators. As for Oregon, the Ducks lost kills leader Taylor Agost but return most of their other impact players and add a transfer from North Carolina in junior outside hitter Taylor Borup. Cook said last weekend’s sold-put team scrimmage went a long way towards getting the nerves out for his newcomers which should pay off this weekend when the results start to matter. Cook wasn’t quite ready to name his starting setter but did share that freshman Nicklin Hames has been seeing most of the first-team reps in practice with junior Mari Kurkov and senior Brooke Smith splitting the rest. As for the second outside hitter position behind senior captain Mikaela Foecke, Cook said it is going to be a game-time decision between sophomore Sami Slaughter and freshman Capri Davis, both of whom have shown sings of brilliance and inexperience. Sophomore outside hitter Lexi Sun, a transfer from Texas, is unlikely to play as she continues to recover from a back injury. Cook said Sun is progressing in her rehab and is doing almost everything but live hitting and blocking in practice. This will be Nebraska’s final year participating in the VERT Challenge as the event is going in a new direction heading forward. Cook said he has something in the works including more top programs to take the VERT’s place on next year’s schedule.